This generation method was initially developed and implemented by Martin Styner, University of North Carolina at Chapel Hill, and his colleagues. You should run Initialize() function before call GetNormalVariate() function. The followings are original comments. ACM Transactions on Mathematical Software, Vol 22, No 1 March 1996, pp 119-127. It is somewhat faster, and uses less memory as the vector of variates is updated in-situ. It has passed all the same statistical tests as decribed in the TOMS article, plus others. Seems OK so far. Works well with total pool of 1024 variates, and does not need two vectors of this size, so does less damage to cache. Has been tested for frequency of tail values which should occur once in a million. OK. Other usual tests OK. About 13 % faster than TOMS version. To use this code, files needing to call the generator should include the file "FastNorm.h" and be linked with the maths library (-lm) FastNorm.h contains declaration of the initialization routine 'initnorm()', definition of a macro 'FastGauss' used to generate variates, and three variables used in the macro. Read below for calling conventions. THIS CODE ASSUMES TWO'S-COMPLEMENT 32-BIT INTEGER ARITHMATIC. IT ALSO ASSUMES THE 'C' COMPILER COMPILES THE LEFT-SHIFT OPERATOR "<<" AS A LOGICAL SHIFT, DISCARDING THE SIGN DIGIT AND SHIFTING IN ZEROS ON THE RIGHT, SO " X << 1" IS EQUIVALENT TO " X+X ". IT ALSO ASSUMES THE RIGHT-SHIFT OPERATOR ">>" IS SIGN-PRESERVING, SO ( -2 >> 1) = -1, ( -1>>1) = -1. A fast generator of pseudo-random variates from the unit Normal distribution. It keeps a pool of about 1000 variates, and generates new ones by picking 4 from the pool, rotating the 4-vector with these as its components, and replacing the old variates with the components of the rotated vector. 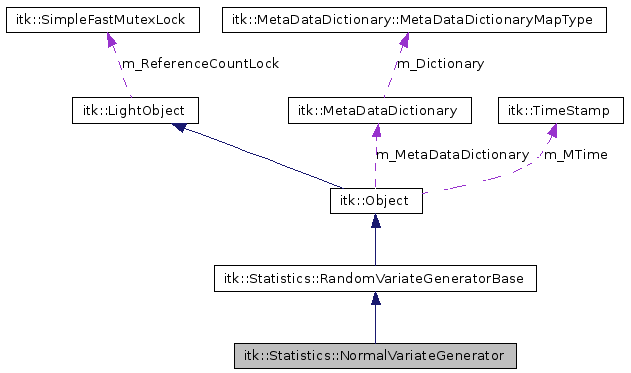 Definition at line 91 of file itkNormalVariateGenerator.h. Definition at line 99 of file itkNormalVariateGenerator.h. 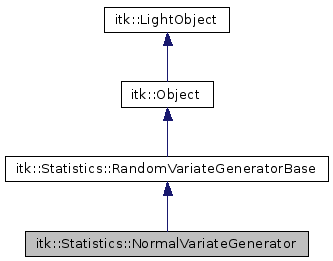 Definition at line 98 of file itkNormalVariateGenerator.h. Definition at line 96 of file itkNormalVariateGenerator.h. Definition at line 97 of file itkNormalVariateGenerator.h.